In a career that has spanned three decades, actor Jeff Goldblum has balanced blockbusters like "Jurrasic Park" and "Independence Day" with smaller films like "The Big Chill" and his latest, "Igby Goes Down", costarring Susan Sarandon and Kieren Culkin. The tall, stage-trained acter plays D.H. Banes, the title character's godfather and quasi-benefactor, whose motives are ultimately questionable. Banes is a man who came from nothing and gained almost every material thing he wanted. Goldblum told The Early Show he was introduced to the script for "Igby" by his former student and the film's writer/director Burr Steers. "For the last 15 years I've been lucky to teach at Playhouse West in Hollywood. He was in one of my first classes," said Goldblum. "He sent me the script, and then called me and said the class was a seminal experience for him. He said I was a great influence … He was very bright, but had a lot of resistance to authority. He gave everyone a hard time, and at times I was harsh to him. I guess he needed a hard time, because he said I really made a difference, which is really what I'm trying to do when I teach." Goldblum said he was initially attracted to the script's issue of family and how challenging its is. "Everyone seems to be striving for that ideal family, but does anyone even know of one," he explained. "I also appreciated the idea of growing up and really trying to claim your own identity." Steers had said that when casting Goldblum's character, he was looking for someone visceral and spontaneous. He said he found that in Goldblum because the actor was alive and funny. "Yes, I was lucky enough to study with a brilliant acting teacher named Sanford Mesiner. He said it is key to be present, to be in the here and now," said Goldblum. "That is the trick of acting, you rehearse and do something over and over again, but you must make sure every time appears like it is the first time." Working on "Igby" gave Goldblum the chance to work with young actor Kieren Culkin. "I can't say enough good things about him. The main thing is just pure talent," said Goldblum. "He seems fearless and is very free and loose. that's what makes a good actor. Besides the work, he cares about real matters and what's going on in the world around him. That is what really distinguishes him." This summer was a busy one for Goldblum. The actor performed in another film from a student from Playhouse West, Scott Caan. The son of James Caan will be making his film writing/directing debut with "Dallas 342" which co-stars Kelly Lynch. Goldblum also finished "Spinning Boris" with Anthony LaPaglia and Liev Schrieber. It tell the story of Boris Yelstin's first election and how he almost lost. His party had to bring in American "James Carville-like" spin-mesisters to help him, and he won by a narrow margin. He also filmed a NBC TV movie about war correspondents called "War Stories." Goldblum was born in Pittsburgh, Pa., Oct. 22, 1952. He attended Carnegie-Mellon University in Pittsburgh. In 1971, he made his stage debut as a guard in a New York Shakespeare Festival production of "Two Gentlemen of Verona." In 1974, he made his film debut, "Death Wish." He starred in the television series, "Tenspeed and Brown Shoe", with Ben Vereen and made his TV movie debut as Ichabod Crane in "The Legand of Sleepy Hollow" in 1980. Glodblum played a journalist in Lawrence Kasdan's "The Big Chill" in 1983. In 1986 he co-starred with Geena Davis (his ex-wife) in the David Cronenberg's remake of "The Fly." 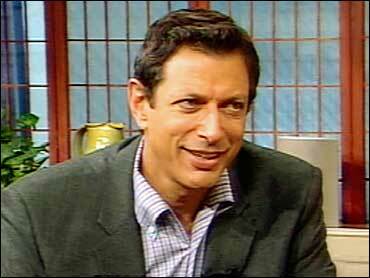 Goldblum had lead role in the blockbuster "Jurassic Park" directed by Steven Spielberg in 1993. In 1996, he appeared in the sci-fi thriller "Independece Day" starring Will Smith. In 1997, he reprised his role as Dr. Malcolm in "The Lost World" Jurassic Park sequel. He appeared with Selma Hayek and Steve Zahn in the comedy "Chain of Fools" in 2000. In 2001, he gave his voice to animated hit children's film "Cats & Dogs." Goldblum is in a jazz band called The Mildred Snitzer Orchestra with fellow actor Peter Weller.